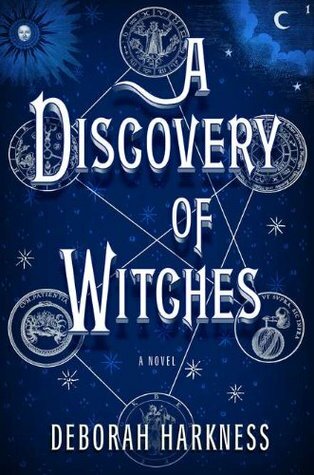 I am very sad to say that A Discovery of Witches is going on my did-no-finish list for this year. I so so so wanted to love this book, in fact I never really considered that I wouldn't love it. The vampires, the demons, the witches, the academic setting, everything screamed 'this book is for you!'. But alas. I'm a big fan of strong female characters, both in books and on TV. Think Buffy, Veronica Mars, Frankie Landau-Banks, Rory Gilmore, Anne Shirley. Women who know what they want and who will go after it no matter what. I am not a fan of Bella-like characters who lose all sense of self because of a gorgeous guy. Unfortunately, it turned out that Diana Bishop, the main character in A Discovery of Witches, is a Bella-type character. She starts out strong and purpose-full, she's writing a thesis, she has research to do, she moves to Oxford and leaves what's left of her family behind. She knows what she's doing and doesn't let anything in Oxford distract her from her purpose, her research. Until she meets vampire Matthew Clairmont and all of it goes out the window. Diana had devoted her entire adult life to making sure that the magic that runs in her family doesn't influence her life at all. She didn't want to have anything to do with anything supernatural - yet once she met Matthew, she seemed to forget all this and didn't see anything strange about being friends - and maybe more - with a vampire. I hated that. I can't decide whether this behaviour was more annoying and disturbing in Bella because she's a teen and is a role model for real teenage or girls, or whether it's worse in Diana because she's in her thirties and really should know better by now. And did I mention that Diana didn't think about Matthew being a vampire at all? Like, at all? She'd have dinner with him, serve him loads of raw meat and then wonder (yes, out loud) what she herself would taste like. And although Matthew got angry and told her never to tempt him, I didn't see any fear at all from her side. No beating herself up for being so stupid, nothing. Like a woman who starts dating someone violent and believes that this time it's different and he would never do anything like that to her. Now there's a great female character to read about. The Diana character wasn't the only thing that bugged me though. The story didn't really unfold as it should have. All of a sudden all these demons started appearing everywhere and then nothing really happened forever, except for Diana and Matthew going to yoga a few times. Honestly, the endless trips to the library with no action became tiresome and boring. I was still reading at this point and I wanted to continue and find that it all gets better. But when I got to the part where we got some information about Matthew's past and the vampires were all calling each other Father and Son, I couldn't stomach any more. I don't think you can use those words, insinuate such close bonds, without providing a hell of a back story. A vamp siring another vamp didn't automatically mean closest family, an I'd-do-anything-for-you kind of relationship, at least not to me. So, the book goes on my DNF list. I know a lot of you really liked it, so I geuss it's one of those books, you either love it or hate it. A sooo agree with all your points. This is one of only four "i quit" this year (so far). I was especially annoyed at Diana's transformation from a strong female lead to a Bella-like wimp, who needs to be protected and kept in the dark for her own good. Also, I couldn't stand one more description of how he smelled of clove - I got it the first 50 times! I have been nervous to read this one, which is why it has been sitting on my shelf for so long. Now I am even more nervous. I will give it a shot one of these days! I really loved this book! I am gasping that you didn't. One of my favorite parts was the yoga class. Then again, I read it for fun. I didn't read too much into it. Nice review! Kailana - maybe I would have liked it at some other time, I don't know... I hope you do enjoy the rest of the trilogy! reviewsbylola - loads of people loved it, I hope you will too! heavenisabookstore - I wanted to read it for fun, it just wasn't much fun for me. I didn't mind the yoga class, it was just that that was all that ever happened. Ah well, you can't like them all! I was wondering about this book, but the more I read reviews the less I'm enthusiastic... espcially since Bella's carpet attitude really annoyed me too.